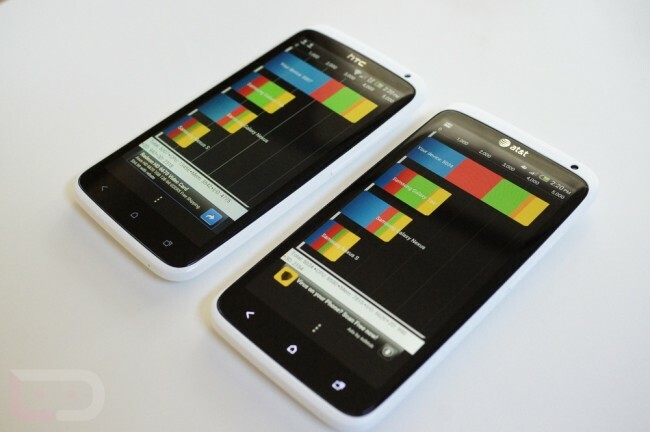 First, if you haven’t checked out our full review of the AT&T HTC One X, then you will want to do that. 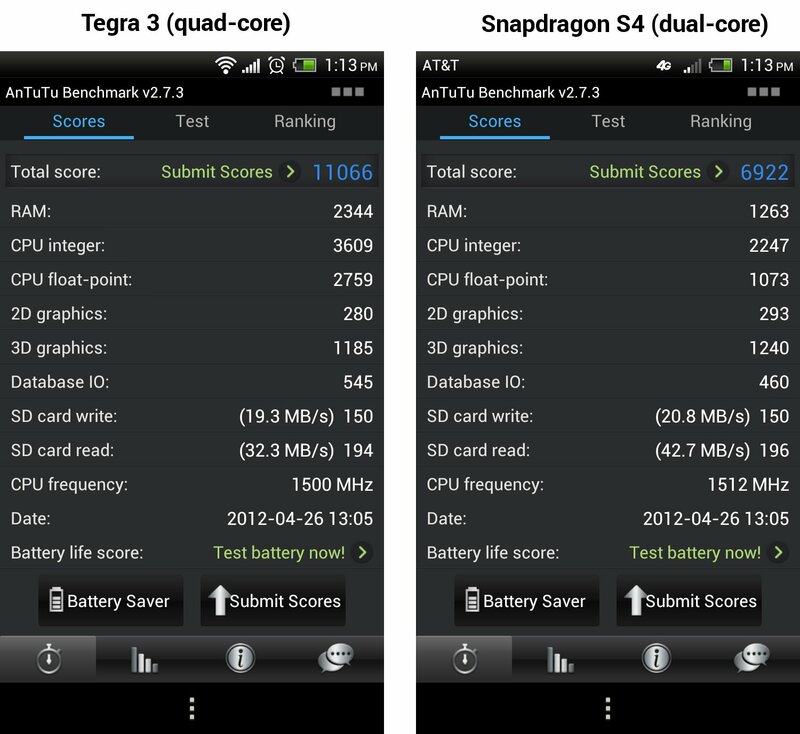 After doing that, let’s go ahead and start the conversation about benchmarks between the AT&T, Snapdragon S4 version and the Tegra 3, unlocked version of the phone. 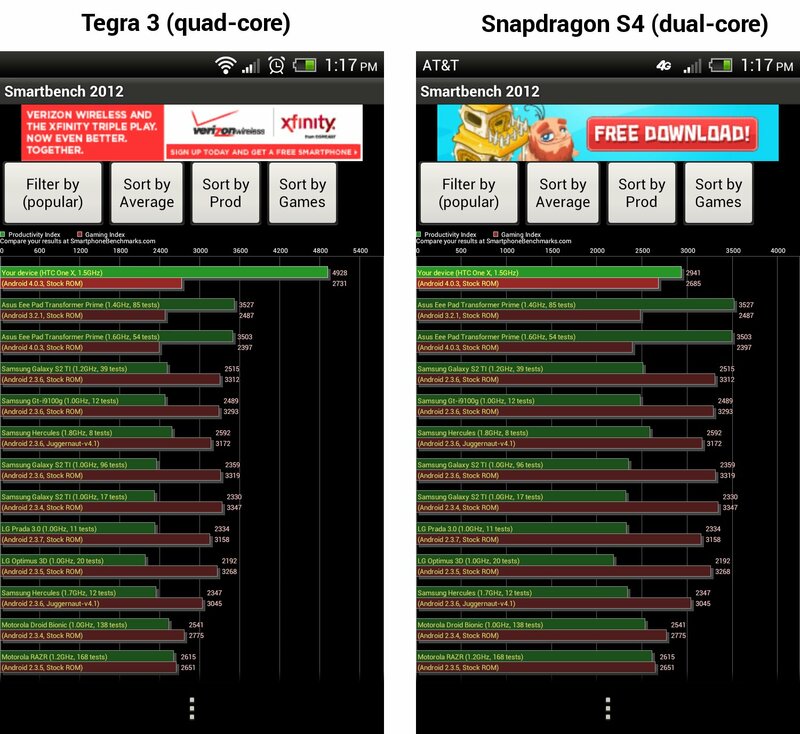 With NVIDIA not having LTE modems for their quad-core processors just yet, carriers that want this phone with LTE capabilities are having to swap out the Tegra 3 in favor of the dual-core Snapdragon S4. Both processors are beasts in their own right, so we thought, “What better way to see if we can find a difference than through a handful of tests?” For those that hate benchmarks and think they mean nothing, we would agree with you to a point. We would have to disagree in that these at least give us something to compare against. We can flip through home screens all day long, open and close apps, look for stutters, etc., but in the end, you need to have numbers. Benchmarks give us numbers. So what did we see? 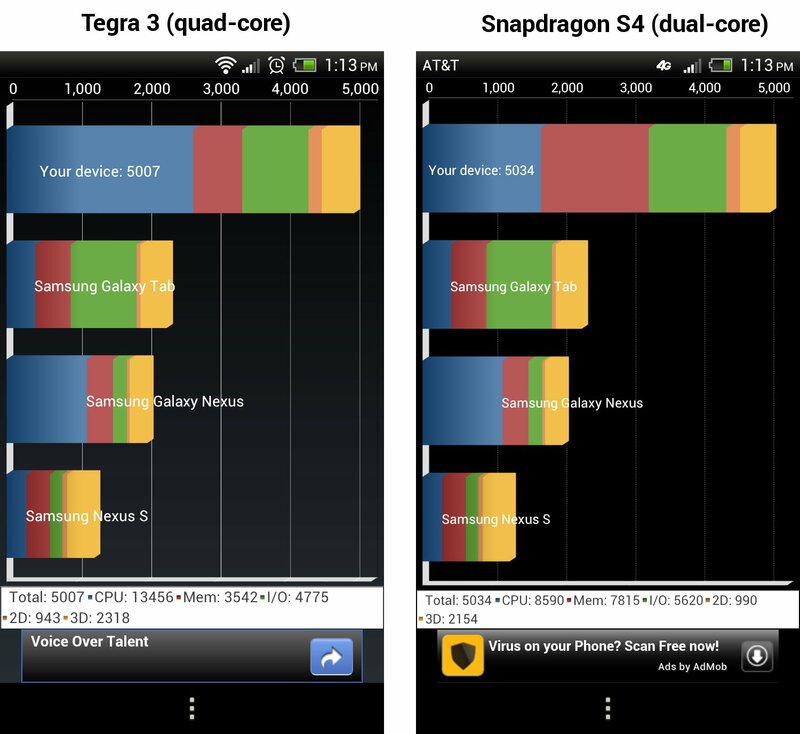 On a pure performance and power level, the Tegra 3 with its 4-PLUS-1 quad-core architecture seems to come out in front of the dual-core Snapdragon S4. 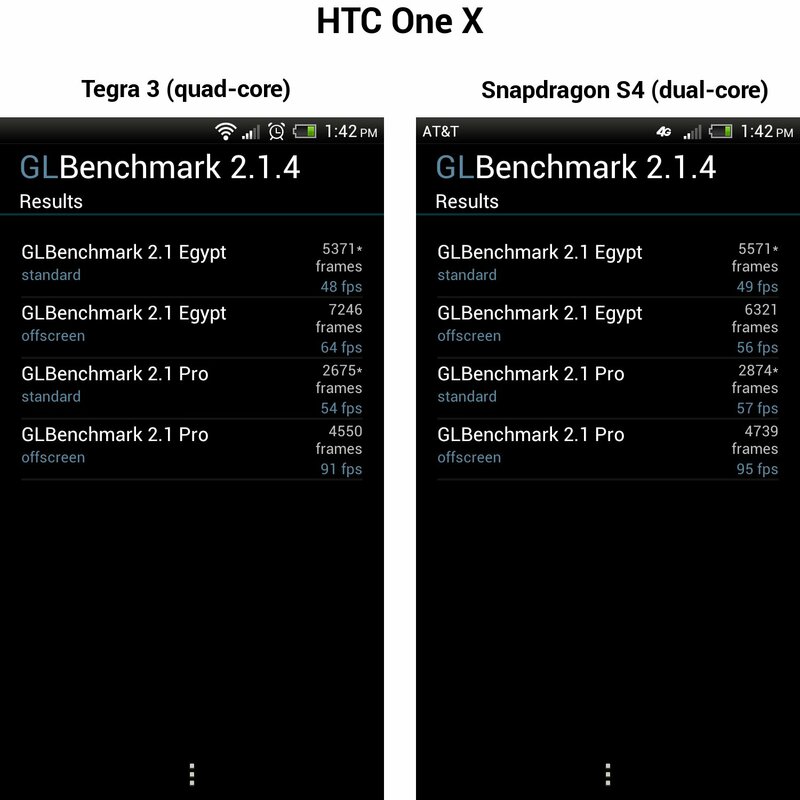 We also noticed in benchmarks like Quadrant that show a constant frame rate, that Tegra 3 seems to hold a higher rate even during the most strenuous of on-screen activities. 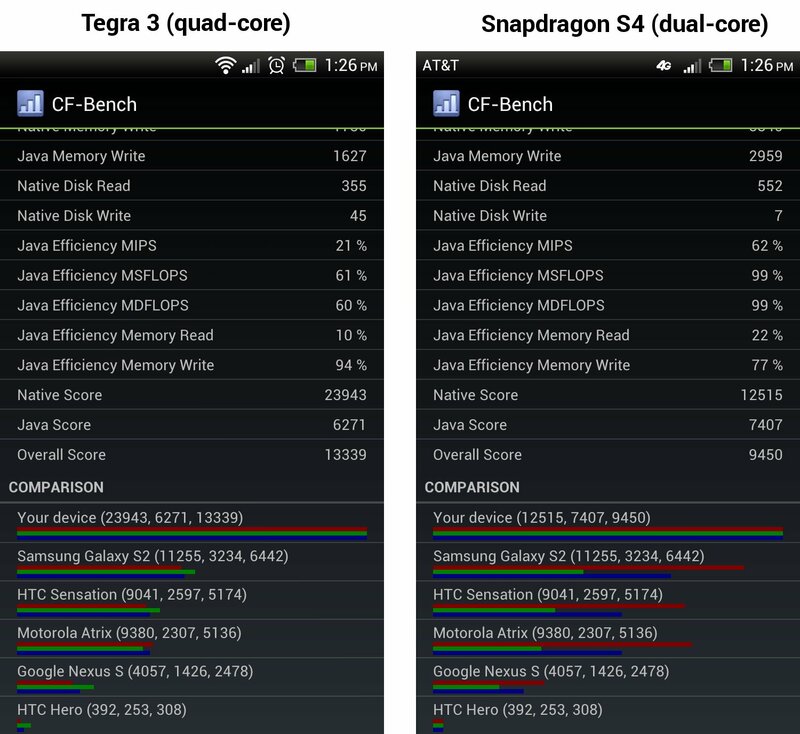 But, the Snapdragon S4 produces higher one-time frame rates than the T3 at times and even bests it completely in some tests, and is clearly no slouch. You won’t find a loser in this battle. If there is one conclusion to draw from these tests, it’s that these two processors (at least for now) are the best in the business for Android devices. Both will probably never slow down no matter what you try to do to your phone, and that’s a great feeling to have.